A Clean and Healthy lifestyle. Smoking is a hard habit to stop because tobacco contains nicotine, which is highly addictive. Like other addictive drugs, the body and mind quickly become so used to the nicotine in cigarettes that a person needs to have it just to feel normal. How Smoking Affects Your Health? There are no valid reasons to start smoking. The body doesn't need tobacco the way it needs nutrients and exercise. And there are many chemicals found in cigarettes, like cyanide, these chemical is actually poisons that can kill in high amount doses. The consequences of smoking may seem very far off, but long-term health problems aren't the only hazard of smoking. Nicotine and the other toxins in cigarettes, cigars, and pipes can affect a person's body quickly, which means that teen smokers experience many of these problems. People start smoking for a variety of different reasons. Pale skin- Because smoking restricts blood vessels, it can prevent oxygen and nutrients from getting to the skin — which is why smokers often show pale and unhealthy. 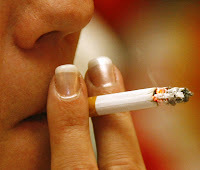 Studies also found smoking to be linked to an increased risk of getting a type of skin disease called psoriasis. Increased risk of illness-Medical studies show that smokers get more colds, flu, bronchitis, and pneumonia than nonsmokers. And people with certain health conditions, like asthma, become more sick if they smoke (and often if they're just around people who smoke). Because teens who smoke as a way to manage weight often light up instead of eating, their bodies also lack the nutrients they need to grow and fight off illness properly. Is there a safe tobacco? The answer is a simple no. Many people wanted to know if pipes and cigars are safer than cigarettes. Or is it better to switch to low tar cigarettes (called "Lights"or "Ultra Lights") or to use smokeless cigarettes. The truth is that there is just no safe form of tobacco. All forms of smoke are dangerous to smokers and nonsmokers alike. Recomended Dietary Program for Athletes. Athletics today require a lot nutrients especially in there chosen field of event. Eating the right foods helps you maintain desirable body weight, stay physically fit, and establish optimum nerve-muscle reflexes. If there is no proper food intake and correct physical conditioning even with expert coaching it would not be enough to push an athletes hidden potential. Good nutrition is a key part in your training program if you are to succeed . The nutrients - the proteins, carbohydrates, fats, vitamins, minerals, and water - are teammates that work together to provide good nutrition. Just as each team member carries out different tasks during a game, each nutrient performs specific functions in your body. A lack of just one nutrient is a disadvantage to your body, just as losing a player to the penalty box is a disadvantage for a hockey team. Your body needs all these nutrients all of the time, so the foods you eat should supply them every day. As a soccer player i also follow the ideal diet for this sport. Maintaining a good diet doesn’t ensure good performance during a match/practice, but it will improve the potential to reach a maximum level of performance. Here is some Information on the types of foods a football player should ideally try to eat and use. Food contains carbohydrate, and fat as well as other important nutrients such as vitamins and minerals. Carbohydrates- Carbohydrate can be divided into a simple and complex form. Examples of the two types of carbohydrate are shown. Simple carbohydrate Complex carbohydrate Low-fat confectionery (sweets / candy) Potatoes, Cakes Vegetables, White Sugar Grain, Jam Bread, Soft Drinks (e.g. Coca-cola) Spaghetti / Pasta / Rice, Fruit. The first few hours after exercise simple carbohydrate can be used to rebuild sugar levels (glycogen stores) at a faster rate. However After 24 hours there is no difference in the two types of carbohydrate. Complex carbohydrate has a high higher nutritional value as it also contain minerals, vitamins, and fibre and therefore this should be preferred. Athletes benefit the most from the amount of carbohydrates stored in the body. 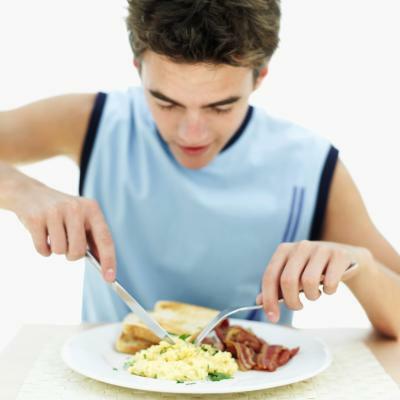 In the early stages of moderate exercise, carbohydrates provide 40 to 50 percent of the energy requirement. Carbohydrates yield more energy per unit of oxygen consumed than fats. Because oxygen often is the limiting factor in long duration events, it is beneficial for the athlete to use the energy source requiring the least amount of oxygen per kilo calorie produced. As work intensity increases, carbohydrate utilization increases.Complex carbohydrates come from foods such as spaghetti, potatoes, lasagna, cereals and other grain products. Simple carbohydrates are found in fruits, milk, honey and sugar. During digestion, the body breaks down carbohydrates to glucose and stores it in the muscles as glycogen.During exercise, the glycogen is converted back to glucose and is used for energy. The ability to sustain prolonged vigorous exercise is directly related to initial levels of muscle glycogen. The body stores a limited amount of carbohydrate in the muscles and liver. If the event lasts for less than 90 minutes, the glycogen stored in the muscle is enough to supply the needed energy. Extra carbohydrates will not help, any more than adding gas to a half-full tank will make the car go faster. All contents and posts copyrighted by Healthy Flat unless or stated otherwise. Images used are credited by their respective owners. For inquiries, or problem regarding to the images kindly send an email to alexispogs[@]gmail.com.